Many of my scientists colleagues are thrilled about these new techniques. They represent the convergence of decades of work in areas as diverse as molecular biology, protein chemistry, cellular biology, neuroscience, microbiology, virology and animal behavior. They are likely to be applied to humans in the near future and this will dramatically change medicine, hopefully bringing cures for diseases that we cannot treat today. And yet, the general public appears to be completely unaware of them. Maybe because they can only be done in animals, and animal research has become a modern taboo. Or maybe it’s just that they are difficult to explain. So, let me give it a shot. The techniques that I am going to describe are known as genetic knock-in. As you probably know, genes are sequences of DNA that get translated into proteins, which, in turn, are like little machines that carry out most of the cell’s functions. Therefore, by changing a gene we can change the protein that it makes and the functioning of that cell, which eventually will show up as a change in the whole animal. Translation of a gene into protein is initiated by a sort sequence of DNA located just before the gene, called the promoter. To knock-out a gene is to manipulate it so that it cannot be translated into protein. Knock-in is the opposite: making an organism express genes from another organism or artificial genes for novel proteins. In biomedical research, knock-in techniques are mostly applied to a few animal species: the worm C. elegans, the fly Drosophila, zebrafish and mice. However, mice are the most relevant for translation to humans because their mammalian physiology, nervous systems, and genes are closer to humans than those of flies and fish. Mice are studied instead of rats or other mammals because it is easier to insert genes in their embryos. Figure 1. Left: sensory neurons and axons in the dorsal root ganglion of a mouse labeled with green fluorescent protein (GFP). Right: GFP-labeled sensory axons entering the spinal cord of the same mouse. Marvizon lab. Fluorescent proteins occur naturally in jellyfish and corals and cause them to glow when they are illuminated by light of certain colors. Scientists have extracted the genes that encode them and inserted them in the mouse genome preceded by the promoter of a certain gene, so that only the cells that express that particular gene get loaded with the fluorescent protein. This allows them to label specific types of cells in a given tissue. When used in neurons, fluorescent proteins allow the visualization of very small features, like axons (Figure 1) or dendritic spines (Figure 2). Figure 2. 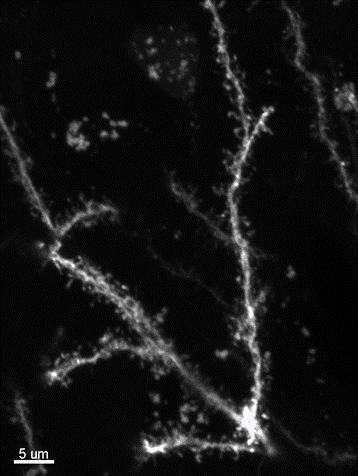 Dendrites and dendritic spines of a neuron in the amygdala labeled with the fluorescent protein mCherry. Marvizon lab. The first to be used was green fluorescent protein (GFP), extracted from a jellyfish. It was followed by others that were given names of fruits representative of their colors (mCherry, mOrange, mRaspberry and tdTomato) or exotic names like Venus, Citrine, mRuby or FusionRed. The use of fluorescent proteins has transformed the fields of physiology and anatomy by vastly improving the ability to identify and locate specific cell types. Until now, this was done using technique called immunohistochemistry, based on the use of antibodies against specific proteins. However, fluorescent proteins provide much higher resolution and avoid many of the artifacts produced by the antibodies. For example, by labeling different neurons with a half a dozen different fluorescent proteins, scientists were able to create the “brainbow” shown in Figure 3. Figure 3. 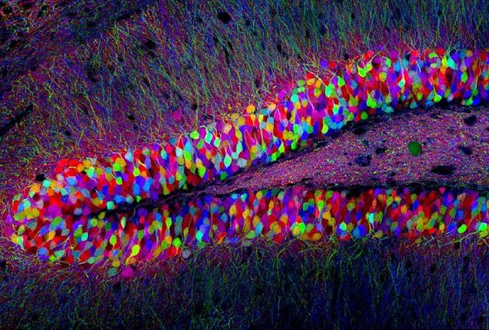 “Brainbow”: neurons in the hippocampus of a mouse labeled with multiple fluorescent proteins. Some anti-animal research groups and individuals have argued that animal research has no predictive value because animal physiology and human physiology are radically different. This is not true. In fact, all mammals use the same set of proteins for the same functions. What is true, however, is that small changes in the amino acid sequence of a protein can cause a drug that binds well to a mouse protein to perform poorly on the same protein in humans. This has slowed down translation of discoveries from animal research to clinical application. One way to solve this problem is to replace the mouse gene with the human gene encoding the same protein. For example, we could take out the mouse mu-opioid receptor (which binds opioid drugs like morphine) and replace it by the human mu-opioid receptor. This replacement would provide a way to study new opioids in mice. The calcium ion Ca2+ is one of the most important conveyors of information inside cells, what scientists call “intracellular signals”. Concentrations of calcium inside the cells are 10,000 times lower than outside the cells and can be slightly increased by opening calcium channels in the membrane to convey a signal. In the 1980s, biochemist Roger Tsien invented several compounds (like Fura-2 and Fluo-3) that can be used to measure the concentration of calcium inside cells through changes in their fluorescence. These calcium indicators perform very well in cell cultures, but their use in tissue slices is problematic because cells absorb them randomly. The solution was to fuse GFP with the calcium-binding protein calmodulin to create genetically-encoded calcium indicators like GCaMP. Like the fluorescent proteins, they can be selectively expressed in particular cell types by associating their gene with a particular promoter in the DNA. This allowed scientists to measure changes in calcium (and therefore observe cell activation) in live mice. This is done by mounting tiny fluorescence microscopes on the mice that they can carry while they move around in their cages. Chemogenetics allows controlling the functioning of specific cell types in live mice. The most popular chemogenetic method was called DREADD by its inventor, Dr. Bryan Roth, which stands for Designer Receptor Exclusively Activated by Designer Drug. The name seems to have caught on, perhaps because of its humorous association with the word “dread”, and it is normally used instead of chemogenetics. What the Roth’s lab did was to take neurotransmitters receptors that inhibit cell function, like the M4 muscarinic receptor, or receptors that increase cell function, like the M3 muscarinic receptor, and modify their neurotransmitter binding site so that they could be activated by a new drug, clozapine-N-oxide (CNO), that has no other effects. The modified receptors are inactive to their natural neurotransmitter, acetylcholine, and to most other drugs. Activating the inhibitory DREADD in a neuron with CNO decreases its ability to fire action potentials, while activating the stimulatory DREADD in a neuron makes it fire more action potentials, permitting for discrete control of behavior. For example, CNO is given to mice in a simple subcutaneous injection and its effect can last for more than four hours. The activation and inhibition of neurons by DREADD can then be observed as changes in the mouse behavior. DREADD can also be used to activate or inhibit non-neuronal cells in any tissue. Optogenetics is similar to chemogenetics in that an artificial protein is expressed in neurons to turn them on or off. However, instead of an artificial drug like CNO, optogenetics uses light. This is done by using light-sensitive proteins like channelrhodopsin (which activates cells) and halorhodopsin (which inhibits cells). The advantage of optogenetics over chemogenetics is that its effect on cells is extremely fast. Its main disadvantage is that it requires the use of light guides, small fiber-optic strings that have to be precisely inserted in the brain or other organs of the mouse. There are now tiny light sources that can be mounted over the head of the mouse and activated by radio waves, so that the mouse doesn’t need to be tethered for the experiment. Still, this is more invasive and difficult than DREADD. An important feature of these knock-in methods is that the expression of any of these artificial proteins is cell-selective, that is, it can be targeted to a particular population of cells inside a tissue, even if they are mixed up with other cells types. This is done by taking advantage of the fact that a particular cell type expresses genes that are not expressed in other cell types. Then, the gene of the artificial protein that we want to express is put after the promoter of a gene that is exclusive of that cell type. Further specificity is achieved by using a technique called Cre-lox recombination. Cre is an enzyme derived from a bacteriophage (a virus that infects bacteria) that recognizes portions of DNA flanked by two sequences called “lox” and deletes them. Hence, when Cre is expressed in a cell with a gene flanked by lox (“floxed”), that gene is deleted. The most simple way to use Cre-lox recombination is for selective gene knock-out in a particular cell type: Cre is expressed under the promoter of a gene exclusive of that cell type and the gene that we want to delete is floxed. When Cre and the floxed gene meet in a cell, the floxed gene is deleted (Figure 4). Figure 4. Diagram of Cre-lox recombination used for gene knock-out. 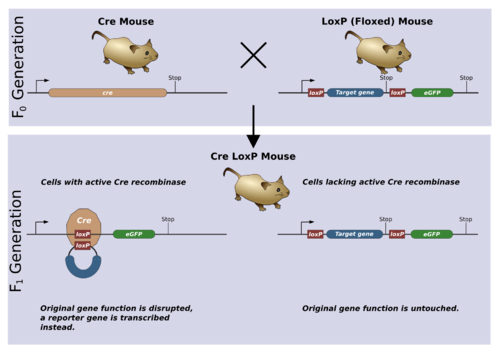 A Cre-expressing mouse is bred with a mouse with the target protein flanked by loxP sequences (floxed). The protein is selectively eliminated in cells expressing Cre. Knocking-in a gene for an artificial protein (e.g. DREADD or an optogenetic receptor) requires a modification of Cre-lox recombination called DIO (Double-floxed Inverse Open reading frame). In DIO the gene encoding for the artificial protein is introduced in the DNA in reverse order (so that it cannot be translated) and flanked by two sets of lox (“double-floxed”). Cutting and pasting by Cre on these two sets of lox sequences results in turning around the gene so that it can be read and translated into protein. Hence, only cells that have both Cre and the double-floxed inverted gene are able to express the artificial protein. DREADD and optogenetic receptors are usually expressed together with fluorescent proteins, which are used as “reporter genes” to identify the cells expressing them. For example, in my lab we are using DREADD to control stress in mice. We do this by manipulating the amygdala, a brain region that induces fear and distress. Some of the neurons in the amygdala produce corticotropin releasing factor (CRF), a pro-stress neuropeptide. We have transgenic mice that express Cre in these CRF neurons, which provides one of the elements for Cre-lox recombination. The other element is a DIO inhibitory DREADD combined with the fluorescent mCherry reporter gene. These are not present in the mouse, but are packaged inside a viral vector: a virus in which the infectious DNA has been taken out and replaced by the artificial genes, in this case the DIO-DREADD-mCherry gene. Viral vectors attach to cells and inject the artificial genes into them. To put the vector into the amygdala we use a stereotactic injection, a method consisting of placing a needle inside the brain of the mouse at the coordinates of a particular region. The vector delivers these genes into all the neurons of the amygdala, but only the CRF neurons that express Cre can turn the DREADD-mCherry genes around so that they can be translated into proteins. Figure 5. 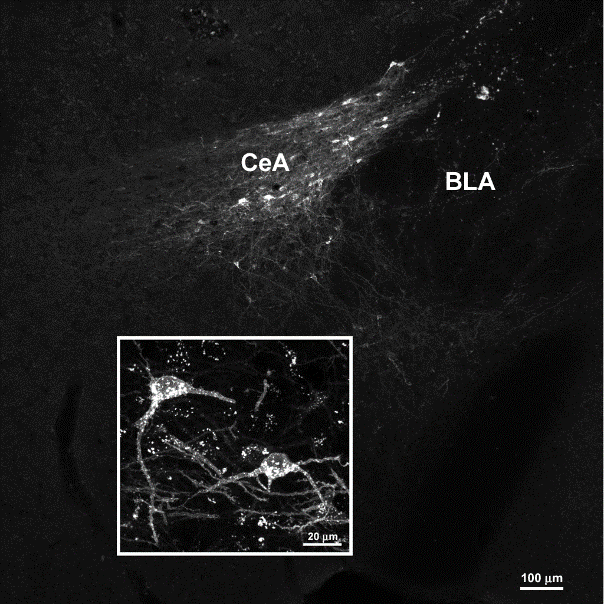 Neurons in the central amygdala (CeA) expressing DREADD and the reporter gene mCherry. Marvizon lab. Figure 5 shows the result: CRF neurons in the amygdala expressing the mCherry reporter gene. How do we know that the DREADD is working? Well, if we take this mouse and we make it swim in a bucket of water for 6 min, it gets stressed and becomes more sensitive to pain. We measure his pain sensitivity by gently poking its paw with nylon filaments and measuring how often it withdraws the paw. However, if we take the same mouse, activate the DREADD with an injection of CNO and put it back in the bucket of water for 6 min, it doesn’t get stressed and does not develop pain sensitivity. The experiment in my lab show that it is possible to inhibit stress in humans using DREADD. We could similarly inhibit the neurons that transmit pain in chronic pain disorders. Conversely, we could use DREADD to stimulate the neurons in the substantia nigra that release dopamine to counter the symptoms of Parkinson disease. Basically, we could pick up any population of neurons in the brain and turn them on or off to fine tune any function of the brain. And we can do the same with any cell of the body. This will create a new type of medicine that selectively target specific cells to fine-tune their function, instead of administering drugs that affect the whole body and thus create a bunch of side effects. As for optogenetics, it may one day allow fast communication with individual neurons using fiber optics, which could form the basis for a brain-computer interface. Calcium indicators could form the other branch of the circuit, allowing the neurons to send back information to the computer. What would it take to move this technology to humans? The main obstacle is that we cannot have Cre-expressing humans like we have Cre-expressing mice. These are transgenic mice, remember, and we cannot have transgenic humans because there are strong ethical objections to altering the human germ line: the DNA that we pass to future generations. This problem can be overcome by giving the Cre-expressing gene and the floxed genes in two separate viral vectors. We are already doing this in mice, but more animal work would be needed before we know how to do it safely in humans. DREADD and optogenetics are already being used in monkeys, a necessary step to adapt these techniques to humans. Let me finish by pointing out that new techniques represent a reversal from what was expected regarding the future of biomedical research. Animal research has been frequently presented as a set of crude methods, a necessary evil that would eventually be eliminated by replacing lab animals with in vitro methods, cell cultures and clinical studies. However, these genetic techniques are moving science in the opposite direction: what used to be done in vitro or in cell culture now can be done inside live animals. In a single experiment now we can gather information about interlinked molecular, cellular, physiological and behavioral events, providing valuable insights of the relationships between them. Far from replacing animal research, cell culture and in vitro methods are the ones that risk becoming obsolete. The use of genetic knock-in in animals today represents the cutting edge of science. Any country that curtails animal research with onerous and unnecessary regulations risks being left behind in the race to develop these exciting new technologies. Posted on December 29, 2018 December 29, 2018 by EditorPosted in News, Science NewsTagged Calcium indicators, Cell-selective gene knock-in, Cell-selective gene knock-out, Chemogenetics, DREADD, Fluorescent proteins, genetic knock-in, Humanized proteins, knock-in, knock-out, Optogenetics, transgenic. Previous Previous post: Research Roundup: Dietary sugar may prevent beneficial bacteria growth; e-bandage speeds up wound healing and more!